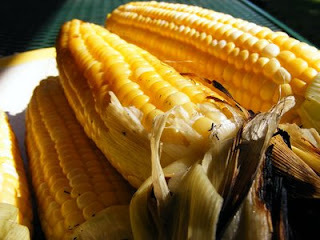 I love corn and I love it grilled then smothered with mayo, dusted with cayenne pepper and parmesan cheese. Soo good... Anyway, grilling corn is easy and the kids think using the husks as handles is cool. This is What's Cookin this weekend on Beaty's Creek. Soak corn in water for 1 hour, this helps steam the corn and keeps husks from burning up. Cook over medium coals for 10-15 minutes. This is so good with anything else grilled. Oh, we did this once and I remember loving it!! I have corn for Memorial Day and since Laura is my corn-husker helper, she thinks we should do this too :) Plus, we will be suing charcoal, so I might as well get my money's worth out of it ;O) Thanks for the instructions!! Oh, and those cookies..oh man! Gonna make those soon! !